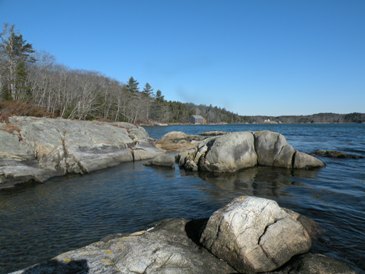 westport island | A blog about "Life on the Rock"
Welcome to a journal of Westport Island, Maine. To locals, Westport Island is also known as “The Rock”. At this Rock Blog, you will find tidbits of island history, photographs, and items of interest. Comments, pictures, and personal histories from those with an interest in the Island are welcome. Westport Island was originally called Jeremisquam and was a part of Edgecomb. It came to be known as Westport, because it was the west port of Edgecomb. The Community Association opened the doors of the Town Hall this past Saturday to welcome friends and neighbors to its 2nd annual Pancake Breakfast. And people came… about 90 of them… to catch up with neighbors, spend time with family and enjoy Art’s buttermilk pancakes with blueberries, Maine maple syrup, sausage, fresh fruit, juice and Westport Island’s own Crossroads Coffee. Yum. Community Association volunteers served up a great breakfast and a pleasant break from the April showers outside. Thanks to the generosity of residents, they also received many donations for the Community Association and our food pantry, Helping Hands. Westport Islanders who sail, motor, kayak or canoe the Sheepscot River have doubtlessly cruised past the Sortwell Chandlery. The Chandlery has been a fixture on the eastern shore of the island since the early 1800’s when it was built as a ship’s store to service vessels sailing up and down river. Later, as McCarty Landing, it served as a steamboat landing. Residents throughout history have been seafarers, farmers, and since the early 1900’s those seeking a summer refuge. Beyond its more practical iterations, as a summer refuge the Chandlery has served as inspiration for many who have had the luxury of absorbing its surrounding natural beauty and calm waters from a singular perch at the tip of McCarty Cove. These days, Cynthia’s daughter, Margie Castleman Evans, the current owner of the Chandlery with her husband, Barry Evans, feels the same love — and derives the same creative inspiration — as her mother from their Westport Island summer refuge. As a lifelong artist in the performing arts, Margie’s passion has turned to the craft of playwrighting. Her first play titled Closing the Chandlery was set in the Sortwell Chandlery. The play was a semi-finalist at the National Playwrights Conference in the Eugene O’Neill Theater Center, the country’s premiere institution for new play development. When firefighters arrived at 46 Greenleaf Road just before 11 am, they saw clouds of smoke. Black smoke was rising from under the eaves, pushing out the chimney and from roof and plumbing vents. Christopher and Bonnie Wormwood and their children were not home at the time. When notified about the fire, they arrived to find their home a total loss and to learn that the family dog, Joycey, and two of their cats had died in the fire. Another cat was spotted darting through the woods by a firefighter and was retrieved by Chris — the one bright note in a dismal morning. Wiscasset, Woolwich, Alna, and Edgecomb firefighters joined the Westport Volunteer Fire Department in battling the blaze in temperatures in the low teens. Unfortunately, by the time the fire was reported and responders arrived, flames had destroyed much of the single-story structure. When firefighters water blasted the front door to make entry, the floor had already collapsed. Many on the island will know the house as the former home of Jeffrey and Debbie Bailey and daughters Erin and Jessica. They, along with the Wormwoods will mourn the loss of a house they called home. After an initial assessment, it is believed that fire ignition may have been electrical in nature. Thank you to all those agencies who responded to contain the fire and stand by for the good part of a day until the scene was safe. Two of our volunteers responded after working night shifts, the Chief took a vacation day from work to respond and several employers donated their workers. The loss of the pets weighed on those who had to remove them. Tonight take stock of your blessings and say a prayer for the Wormwood family. In a tradition that goes back for more than 100 years, Islanders gathered for a neighborly Christmas celebration with caroling and a tree at the historic “town center” (the Community Church and the Town Hall) on December 9. It’s always nice to visit with neighbors and friends and take pause to appreciate what a nice community we have. May the young and the young at heart enjoy this Christmas Day and season of giving and forgiving. Once again, Westport Island voters turned out in large numbers to have their say in yesterday’s election for Governor, U.S. and State Senate and House seats and various county offices as well as a home care referendum and five bond issues. On a local ballot, Islanders were also asked to affirm — and did so overwhelmingly — the draft Vision Statement of the Comprehensive Planning Committee. The Vision Statement was developed based on the answers of 295 respondents to a survey this summer requesting them to rank their priorities for future growth and development of the island. The Vision Statement was designed as a blueprint for completing an update to our Comprehensive Plan. With 477 voters (final out-of-country and military voters are not yet tabulated), Westport Island’s voter turnout hovered around 72 percent, about 10 percent less than the record-breaking turnout for the 2016 presidential election. New Westport Island Town Clerk Julie Casson did a great job managing her first solo election alongside 21 election volunteers all of whom made “Vote 2018” welcoming and successful. As evidenced by the town’s vote totals below, Westport Island’s voters pretty much voted in lock step with their state and county neighbors on the Federal/State/County ballot. The overall winning candidates and referendum votes are noted in italics where results are available. 1898: To vote a straight ticket, mark a cross X in the square over the party name at the top of the ticket. 2018: There is no square for a straight party ticket; vote for the candidate of your choice by filling in the oval to the right. To vote for a Write-in candidate, fill in the oval to the right of the Write-in space and write in the person’s name. 1898: To vote other than a straight party ticket, mark a cross X in the square over the party name, as if to vote a straight ticket, then below, in same column erase any name or names, and fill in the name or names of any candidate you choose in the space left for such purpose. 2018: Vote for the candidate of your choice by filling in the oval to the right. To vote for a Write-in candidate, fill in the oval to the right of the Write-in space and write in the person’s name. TO HAVE YOUR VOTE COUNT, DO NOT ERASE OR CROSS OUT ANY CHOICES — REQUEST A NEW BALLOT IF NEEDED. 1898: Mark a cross X in the square over Yes or No, where either of these words occur, as you desire to vote. 2018: To vote for a question, fill in the oval to the right of the YES or NO choice. 1898: Do not mark your ballot in any other way. 1898: If you spoil a ballot return it to the ballot clerk and he will give you another. You cannot have more than two extra ballots, or three in all. 1898: You must mark your ballot in five minutes if other voters are waiting; you cannot remain within the rail more than ten minutes. 2018: There is no time limit. 1898: Before leaving the voting shelf, fold your ballot as it was folded when you received it and keep it so folded until you place it in the ballot box. 2018: There is no folding protocol; simply return all ballots that you were issued. 1898: Do not show anyone how you have marked your ballot. 1898: Go to the ballot box and give your name and residence to the warden or presiding election officers. 2018: Go to the ballot box and place all the ballots you were issued in the box. 1898: Put your folded ballot in the box with the Certificate of the Secretary of State uppermost and in sight. 2018: Just put your folded ballot(s) in the box. 1898: A voter who declares to the presiding officer or officers, (under oath if required), that he cannot read, or that he is physically unable to mark his ballot, shall, upon request, be assisted in the marking of his ballot by two of the election clerks, who shall be directed to so assist by the presiding election officer or officers. 2018: If you need help reading or marking the ballot, you may ask a relative or friend for assistance. The helper does not have to be a voter or old enough to vote. An election official can also help you read or mark a ballot. However, your employer or union official cannot help you vote. For Westport Island election information, see the Town website. The seven-member House Tour Committee Co-Chaired by Callie Connor and Judy Hughes worked for a year and a half to stage this event. Committee members each brought talents to the table that wed history and historic preservation backgrounds with creative, accomplished Westport Island event planners. Essential to this effort were the homeowners, their families, about 62 volunteers, the History Committee, the Westport Volunteer Fire Department and the tasteful entertaining flair of Louana Frois with the help of Simply Susie’s Catering and flower arranger Posies in the Pines. I am sure I speak for the many that attended your wonderful tour. The houses were a joy to see, the owners/docents generous with their time and cordial attitude. As far as the luncheon, the tables were artfully and beautifully appointed and certainly befitting good food! Lastly, the tour revealed the real Westport. Since Callie Connor joined the History Committee in 2015, she had a vision for conducting a Historic Homes Tour on Westport Island. Callie, a Professor Emerita of Classics, University of North Carolina at Chapel Hill, is a devotee of historic preservation. She serves on the boards of multiple North Carolina organizations dedicated to illuminating and increasing appreciation of history as told through everyday homes and architecture. Callie and her husband, Bob, are both academics with a passion for history that carries forward into daily living. They bought the historic Cornelius Tarbox, Jr. home on Westport Island and have been working to preserve the home and solve the mystery of who painted the folk art marine murals decorating the entryway since they arrived. The History Committee had never sponsored an historic homes tour, but was “all in” once fellow member and Island entrepreneur Judy Hughes heeded the call to join Callie in defining and developing the event. The House Tour Committee was born and enlisted veteran Island event organizers Ann Springhorn, Carole Dunbar, Tania Hayes, Ruth Nelson and Sally Howe. Callie developed the criteria for selecting the homes that would be highlighted on the tour, focusing on those with both external historic character and interior historic features that had been preserved. Multiple homes fit the bill, but the first selections each offer a very interesting vantage point on Island history. Photo credits to: Mary Coventry, Jeff Tarbox, Archie Bonyun and Crissy Swartz. Last Saturday, islanders had the opportunity to help a neighbor while enjoying dinner — and getting a break from fixing dinner at home in a hot, steamy summer kitchen. Sue Anderson and friends organized a spaghetti dinner fundraiser at the Town Hall to help Ethan Langley with medical bills from a protracted illness due to liver failure. Sue and Ethan grew up on the island together; and according to her mother, Cheryl Anderson, Sue decided to organize the fundraiser because “that’s just the kind of person she is.” As a paramedic, Sue also sees the fallout from serious medical issues on a daily basis. Between the dinner, a 50/50 raffle, a silent auction and T-shirt sales, more than $2,000 was raised to help the Langley family with medical bills and transportation costs. Although Ethan was unable to join his supporters, he called in from Leahy Clinic to express his appreciation and get a rousing “Hey Ethan!” from his home team. Ethan has been living back at home with his mother, Diane Langley, as he weathers the ups and downs of awaiting a donor for a liver transplant. He has been unable to work since October when his health took a marked downturn. Those who have suffered catastrophic illnesses know the secondary trauma of being buried by mountains of medical bills. Despite his trials, Ethan walked into the fire department this past April volunteering to do “whatever he could” because he wanted to give back. He’s made a valiant — and much appreciated — attempt to be a part of the fire department despite recurring and significant health challenges. Ethan’s came home this week but will return to Boston Tuesday to find out his ranking on the donor list. Prayers are appreciated. Well wishes can be sent to him at 309 Main Road, Westport Island, ME 04578. For those who were unable to attend the spaghetti fundraiser and who might like to add their support, there is an account set up for Ethan at Midcoast Federal Credit Union: Account No. 606113, 41 US-1, Edgecomb, ME 04556. It was sad to miss Chief Mooney’s company, but affirming for new Fire Chief Stacey Hutchison that his first barbeque as Chief appeared to be an overwhelming success. When all expenses are paid, the WVFD will likely have raised $2,500 – $3,000 from dinner & dessert donations, T-Shirt sales and raffles. And surely there was a nod of appreciation for the sounds of the Old Grey Goose Band who stepped in to serenade us when the Back to Basics Blue Grass Band was otherwise engaged. there are generous event sponsors who help to underwrite the event — Bath Savings, Norm’s Used Cars and John E. Bailey (whose donation honored the memory of WVFD Fire Chief Alan Anderson). This year also saw a new “guardian angel,” Liz, the innkeeper of the Squire Tarbox Inn who, along with the inn’s new owners, allowed us to piggyback our food order on the inn’s so the WVFD could benefit from wholesale pricing and reduce costs. Thank you all!! …And — congratulations to Robert DeLong for walking away with $212 after winning the 50/50 raffle! If you want to help with next year’s event, speak to Fire Chief Stacey Hutchison or one of the Co-Chairs of the Community Association, Drew Porter or Art Weber.